All the aspirants of Joint Entrance Exam (JEE) are hereby requested to notice that the JEE Mains 2014 would require a submission of the hard copy of their class XII qualifying mark sheet. This has to be submitted to the invigilator on the day of the exam at the examination center, before commencement of the exam. Failing to do so, the candidate would not be allowed to sit in the examination. Candidates appearing for both pen and paper examination, as well as the computer based examination, would be required to submit the hard copy of the mark sheet. This is mandatory for those candidates who have already qualified their class 12 examinations and thus it is feasible for them to submit the hard copies. However, those candidates who would be appearing this year for improvement exams, can get copies of their improvement examination admit cards along with their old mark sheets. Whereas those candidates who would be just appearing for their class 12 examinations this year, they have to get the hard copy of their respective admit cards/hall tickets. Candidates are supposed to write their respective JEE main exam roll number on the document, while submitting the copy of the mark sheet or the hall ticket to the invigilator. Admit card will be available from March 1, 2014. 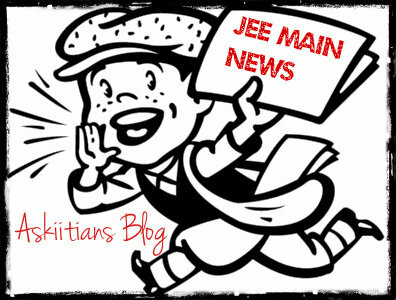 JEE Main 2014 Exam Results will be out on May 3, 2014 (tentative). Declaration of All India Ranks will happen on July 7, 2014. Please note: Students whose Class 12 result would be declared after June 25, 2014, would not be eligible to receive the All-India-Ranking of JEE Main 2014. The JEE Mains 2014 exam would be conducted to facilitate admission for undergraduate engineering and architecture courses in the country. Those candidates securing the topmost 1.5 lakh ranks would be qualified to appear for the JEE Advanced exam, which is the qualifying examination for admission to various undergraduate engineering courses at the Prestigious Indian Institutes of Technology and ISM Dhanbad.